There is a degree of sincerity behind the arguments that people make when they blame certain societal ills on the cable entertainment channel known as MTV. Inner-city violence? Blame MTV. Teenage pregnancy on the rise? It’s MTV’s fault. Kids wearing their pants down around their femurs? That damn MTV again. High school truancy – MTV. Tattoos and nose rings; it’s all about the MTV, don’t you know? Well, as it happens, I do blame MTV for perhaps one of the most frustrating, if not outright annoying, musical instruments ever conceived: The acoustic-electric bass guitar. When MTV came out with it’s series of “Unplugged” concerts in the early ’90s, and everyone from Eric Clapton to the Meat Puppets picked up some softened stage time, acoustic music became cool again to people beyond the Peter, Paul and Mary set. 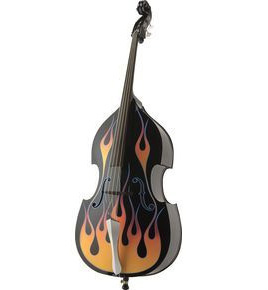 The added exposure resulted in an increase in demand for the acoustic-electric bass. It seems, out of the box, to be a two-headed redundancy. If you need the bottom end of a bass guitar under your music (as most bands do), then plug in a bass and thump away. If you’re after a pure bass sound but without the heavy amplification, you’re best off finding a upright bass, and you proceed from there. Acoustic-electric bass guitars provide neither the powerful diversity of an electric bass nor the mellow depth and resonance that comes from the larger-bodied stand-up. The sound falls somewhere in between… And in between is a V-shaped canyon that troughs out at a very thin point, which is what you’re getting out of this ungainly thing (try maneuvering around onstage with a Grandfather clock strapped to your chest), the payoff for sacrificing all feeling in your fingertips. I’ve owned a couple of A/Es, both of them made by Dean (neither of them particularly inexpensive), and have labored away on several others, including those made – in the interests of supplying the aforementioned demand – by Fender and Ibanez. In addition to being less than wieldy and sounding somewhat airy coming through the speakers, they’re also unpleasant to play, due to the amount of fret buzz and screech that inherently comes with strings that are as big around as barbecue skewers. Who would want to add that to the sound of their music, even an acoustic jam, as they are in no way suitable for bands featuring electric guitar? If there were no other options, maybe, but an electric bass is so much more versatile and makes music sound so much better (whether you’re playing or recording) that an acoustic-electric bass becomes nothing more than an attractive-looking, unneeded gimmick, on stage or in the studio. In almost any event, sound-wise, it would be inferior by default to just about any other bass guitar in the building at the time. It would be another matter entirely if it functioned well as an acoustic instrument, but it doesn’t really even do that well enough to justify its existence – it regularly gets drowned out by any dreadnaught-sized acoustic guitar that is played with more than 33 micrograms of passion or effort. It remains a bit of a mystery as to why anyone would want this oversized ornament in their collection (much less use it on a working basis), yet they remain in most music store inventory rotations… Oh, and you’ll find a lot of them in pawn shops, too. Of course there are exceptions; in the hands of a professional, in the right musical setting, a top-shelf acoustic bass may be just what one’s sound requires. By and large, though, it simply has few advantages over its electric and stand-up counterparts. If you just want a different look and sound for your band, you’ll get more mileage and more fun out of the plastic-bodied, silicone-stringed, toy-sized Ashbory bass (made at various times by Fender, Guild and DeArmond). Even that will offer you more depth and versatility than an A/E bass, won’t give you a sore neck, and certainly doesn’t require a pickup truck or station wagon for transportation. Do what you want, fellow musician. Crowd the stage with trumpet lilies, pull on a Cardigan and get folky with it, if that’s your thing. 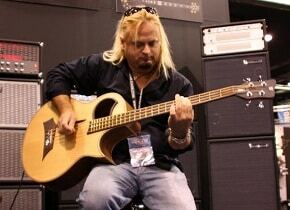 But please, if you only “plug in” one instrument, make it a decent electric bass guitar. The ghost of Woody Guthrie, I promise, will not haunt you in the night.